First impressions are everything, you know. 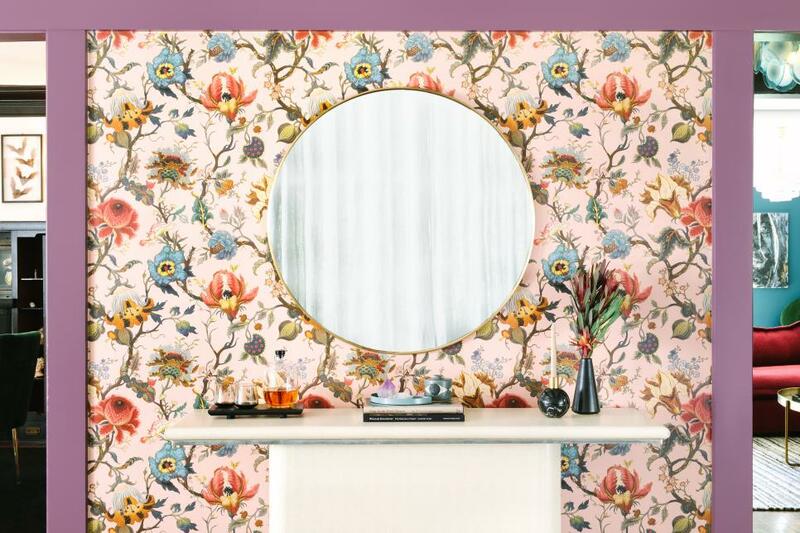 In this small foyer, playful posies dance across pale pink wallpaper, contributing to the whimsical appeal of this bright, lavender-trimmed space. 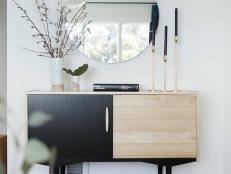 A modern brass mirror is centered above a striking, ivory console table, creating a cool catch-all for keys and last-minute lipstick checks before hitting the road. 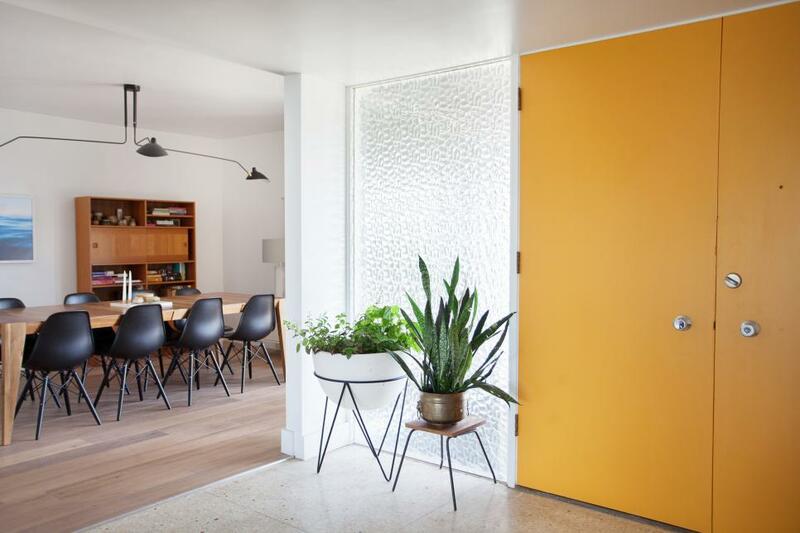 Marigold makes a statement in this expansive, mid-mod entryway. 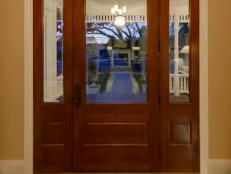 The double front doors sport the sunny shade and infuse the otherwise white foyer with warmth and modish flair. If a tropical wallpaper and palm centerpiece don’t knock guests off their feet, what will? 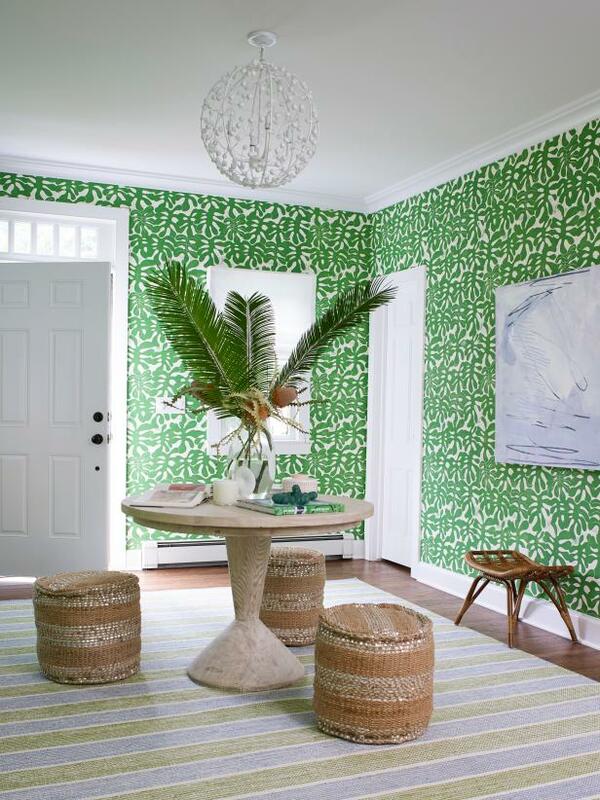 We’re enamored with the bright Kelly green hue paired with a trio of rattan poufs in this fun, free-spirited foyer. We’re blushing over this soft pink and beige foyer. 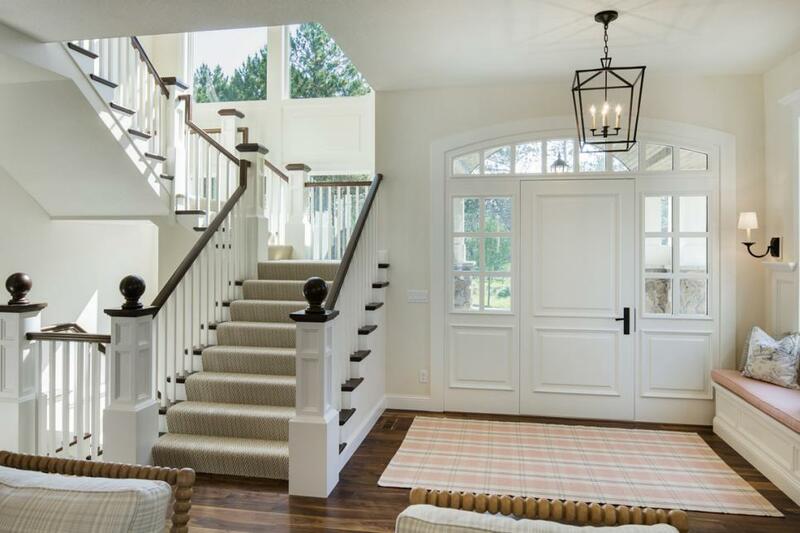 The barely-there blush hue is ideal for this airy foyer, as it infuses the design with color, without overpowering the clean traditional details throughout. 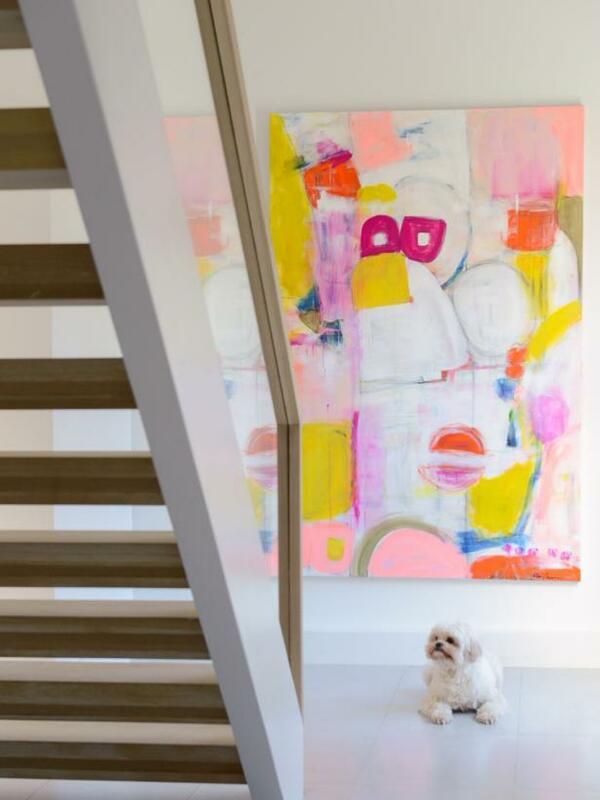 Pint-sized pooch or painting connoisseur? We’ll let you decide. 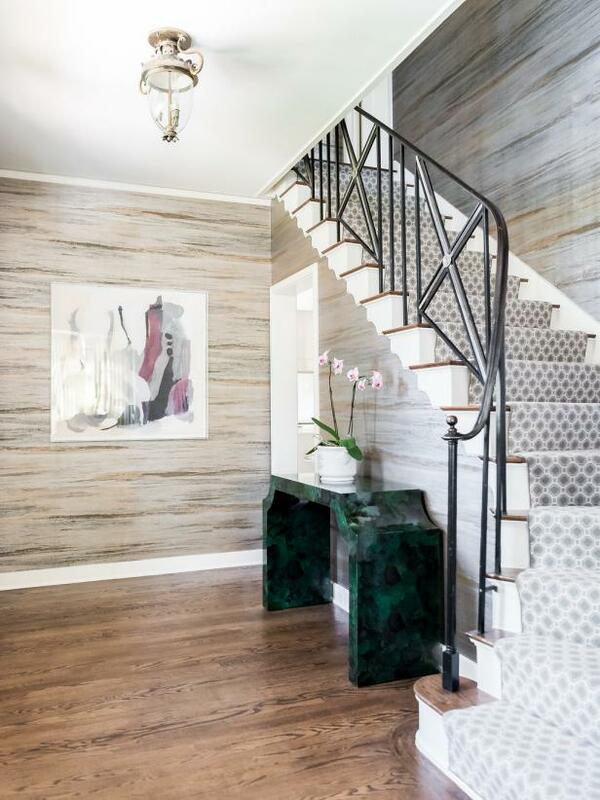 The oversized, abstract painting serves as a high-fashion finishing touch for this modern, bright white entryway. Hot pink and highlighter yellow dance together along the canvas, intermixing with a few, fiery splashes of orange and smudges of cobalt blue. A whisper of blue kisses the walls of this traditional foyer. 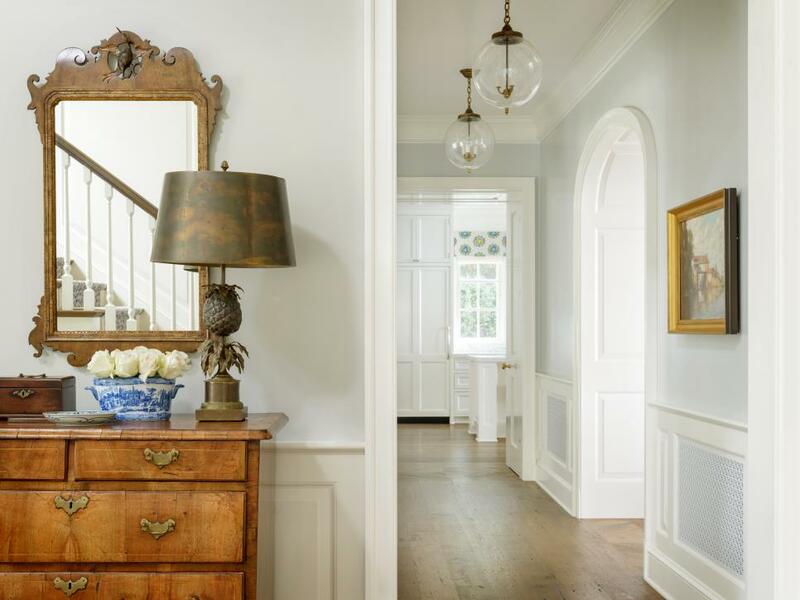 Clear globe fixtures light up the wide hallway, where classic moldings and wainscoting bring architectural detail to the space. In the entryway, an antique dresser is topped with an ornate mirror and pretty accessories for an elegant vignette. 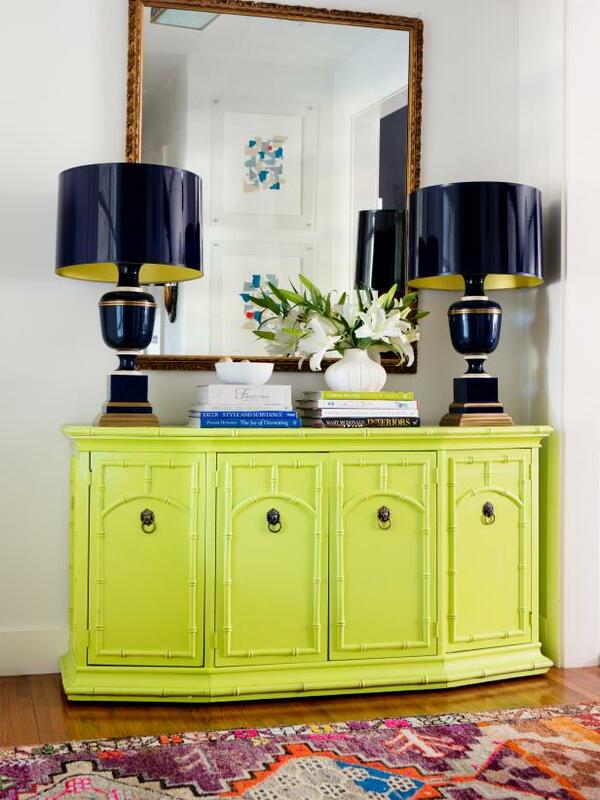 Chartreuse steals the show in this unexpected, yet undeniably stylish, foyer. The shocking yellow-green hue coats a bamboo buffet and sits beneath a vintage, gold-framed mirror. Gorgeous, glossy navy blue table lamps sit atop the entry table creating killer contrast against the lively hue, and welcoming light to come home to at the end of a long day. Black, white and oh-so-beautiful. 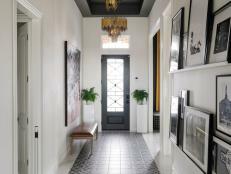 This foyer forgoes bright and bold hues for a neutral color palette. 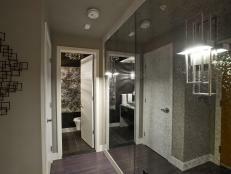 The space is the picture of class, boasting glossy checkerboard floors and scrolling floral wallpaper. An antique lantern glows above, dangling at the perfect height to highlight the elegant, arched doorway. We (double-dog) dare you to find a bigger (bow) wow factor for a foyer than this, oversized collie portrait. 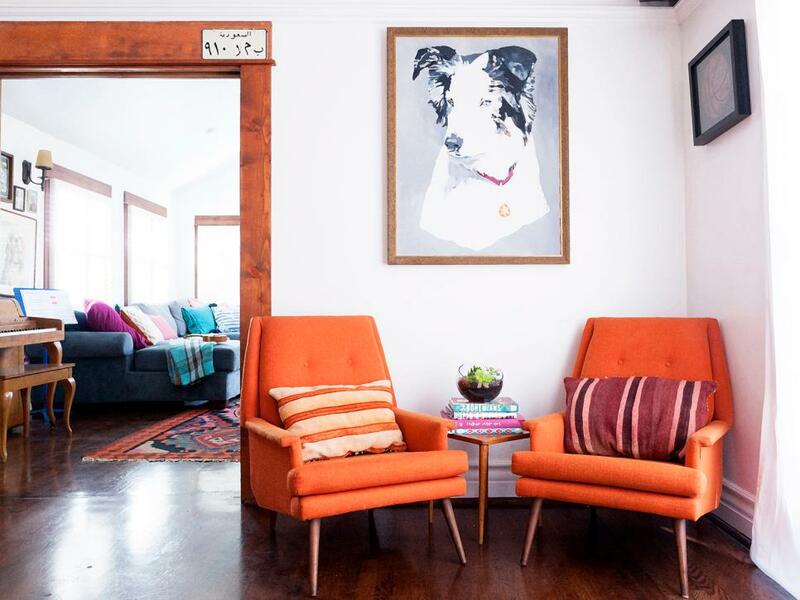 The perky orange armchairs are a close second, we admit. Still, nothing holds a candle to that posh, posing pooch. A Henri Matisse print and a handsome, midcentury dresser infuse warmth into this white, industrial apartment foyer. A pair of smoky glass vases showcase springy, green stems beside a smart stack of books. White walls? Haven’t seen 'em. 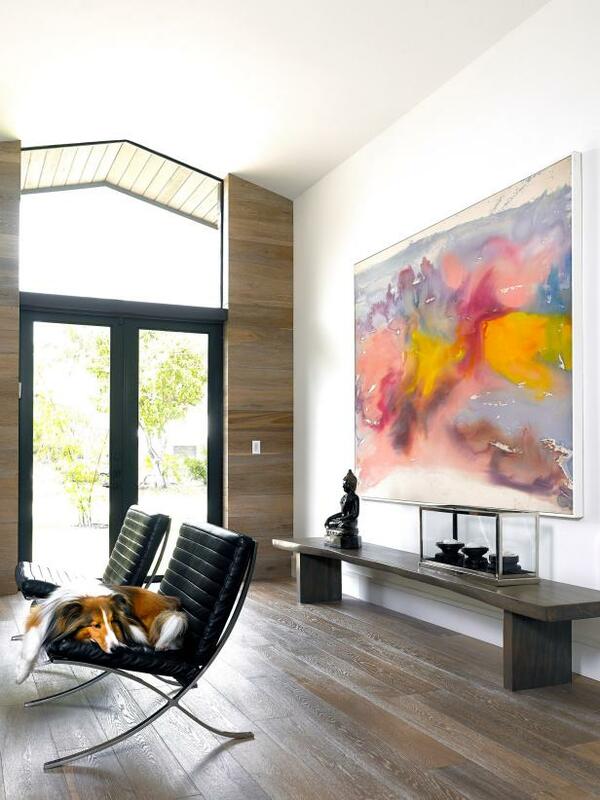 This modern home boasts a giant painting that infuses its entry with swirling mix of electric coral, smoky periwinkle and a rich, golden mustard. The vignette is almost stunning enough to distract from the unmatched cuteness that is the home’s resident collie. Key word here: almost. 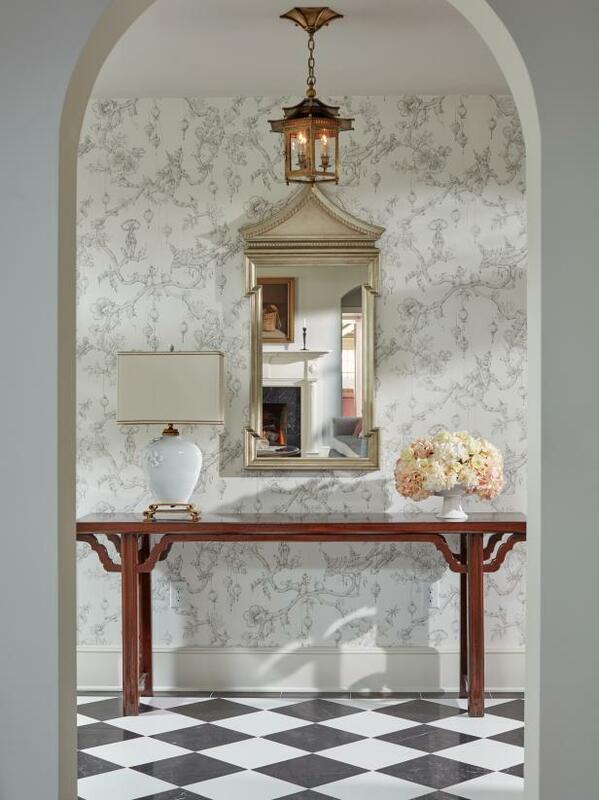 This silvery gray and smart, navy blue vignette appears both playful and polished in the contemporary entryway. The glossy mahogany console serves as a stunning contrast against the cool, misty tones of the wall, art and upholstery. 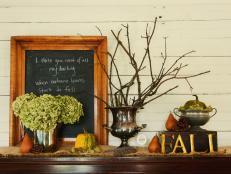 This spirited entryway is sure to satisfy your sweet tooth. Bright pink walls serve as a bubbly backdrop for a glam, mirrored Art Deco-inspired table, a bold turquoise lamp and an oversized, palm frond painting in a swirl of cotton candy hues. 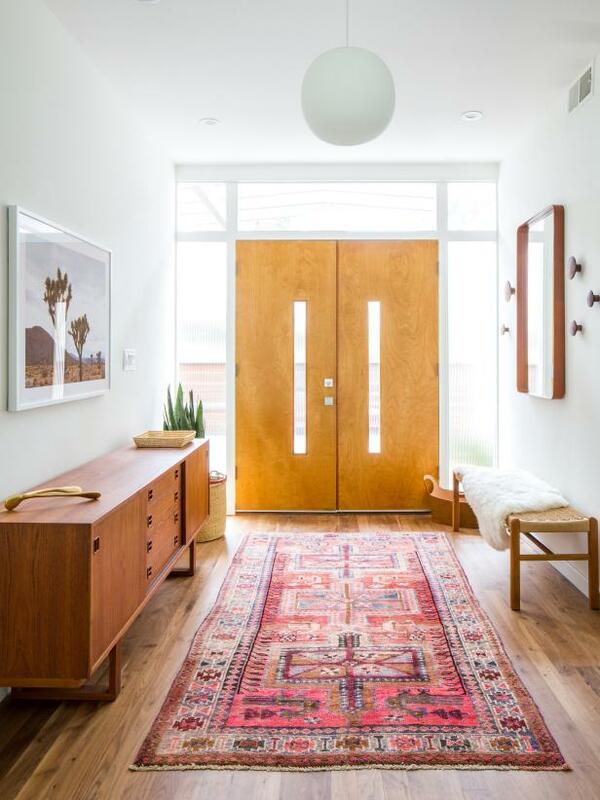 Beige is anything but boring in this eclectic, bohemian entryway. 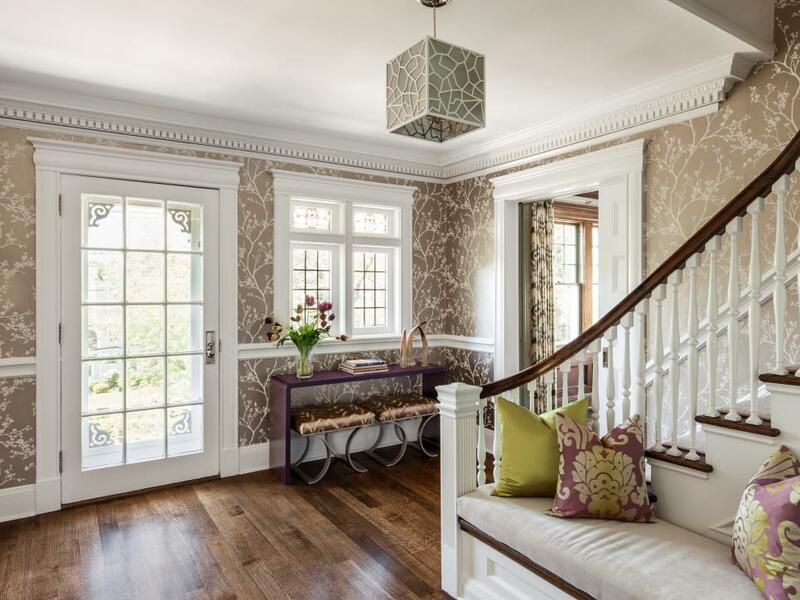 The foyer niche sports dashing beige and white wallpaper to create dimension against the surrounding white walls. 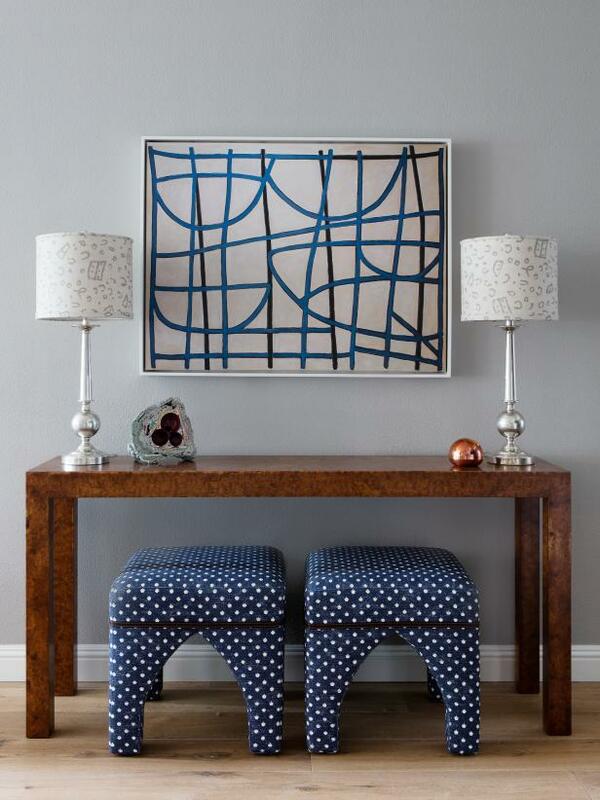 A pigmented, red and navy Persian rug frames a minimalist console table and a pair of petite stools. Above, a gilded sunburst mirror reflects the vibrant, turquoise wall art across the room, providing an extra pop of color. 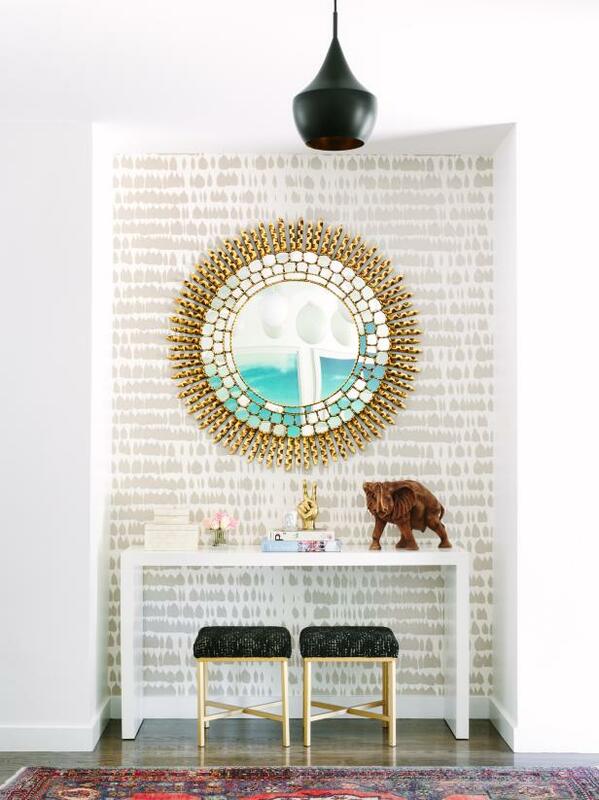 Fluttering butterflies and birds line the walls for a playful touch, while a classic wooden credenza and fancy gold mirror create a classic vignette that anchor the entryway. 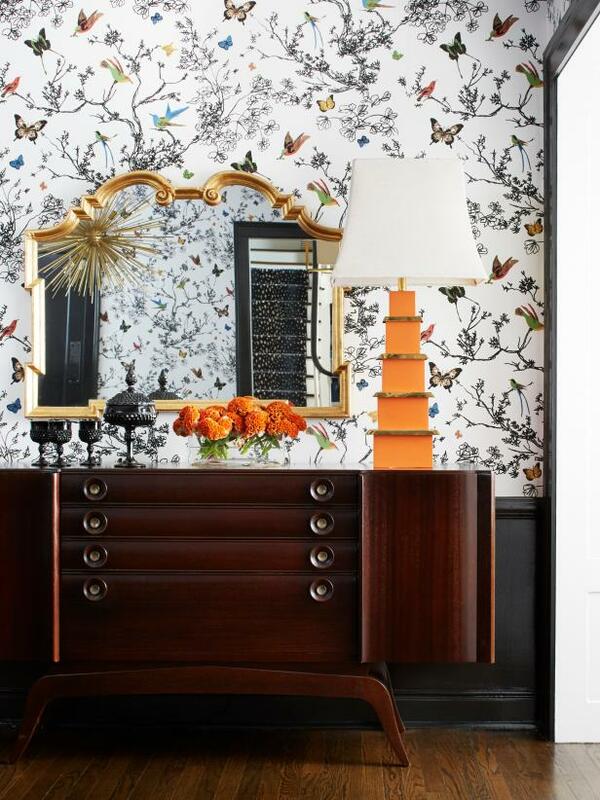 A vibrant, orange Chinoiserie table lamp serves as a fresh, fashion-forward garnish for this funky foyer. A steep stack of books have never looked quite as cool as they do here. A duo of royal blue stools complement the warm wooden door, and make a stylish statement beneath a sleek, silver console table. 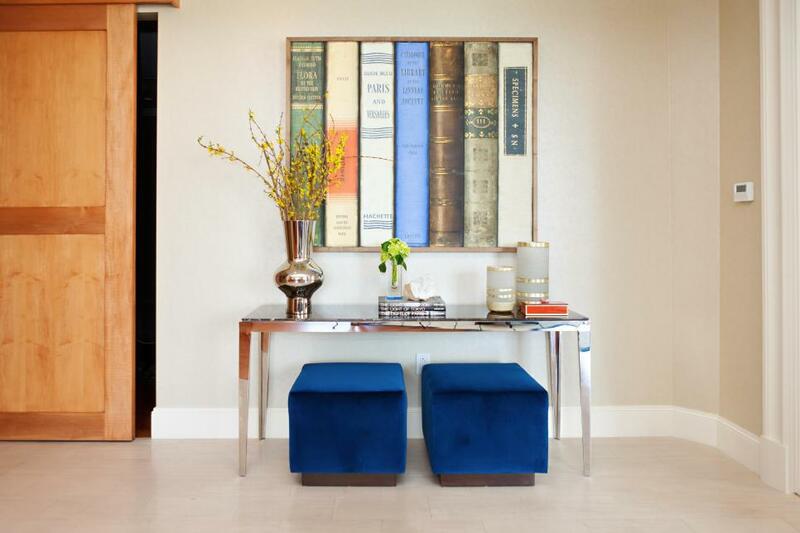 The chic, book spine painting serves as an instant ice-breaker and pulls the space together with hints of the vibrant hues from the front door and velvet stools below. Oh, friends. We don’t know which delightful design detail to gush over first. The strapping, striped purple stair runner? The triple-decker rainbow pom-pom coat rack? Those flickering, fiery orange and magenta paint strokes displayed on the landing? It’s all too good. This is not your average pink and blue, boys and girls. We’re drooling over this vibrant, elevated makeover of the classic color pairing. 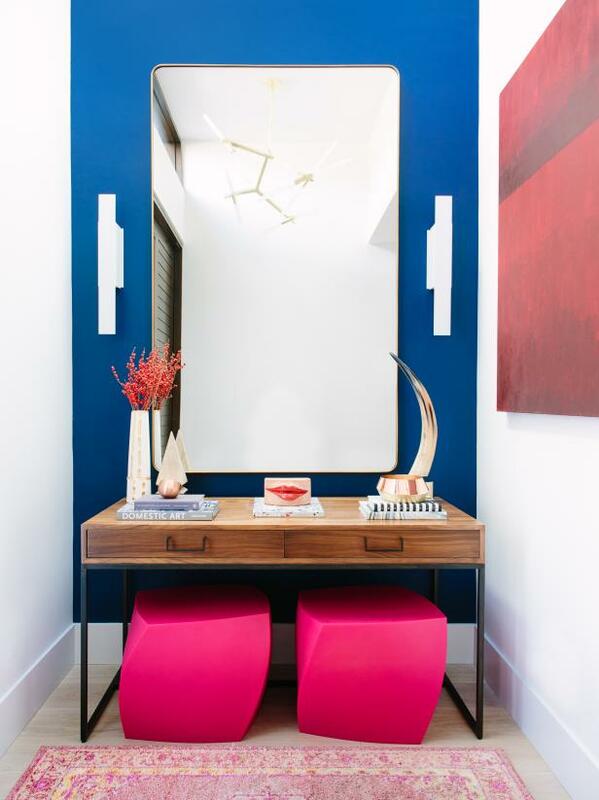 A cobalt blue wall pairs with hot pink stools to create an electric vignette in this funky, modern foyer. Pattern and color are abundant in this bright, white foyer. 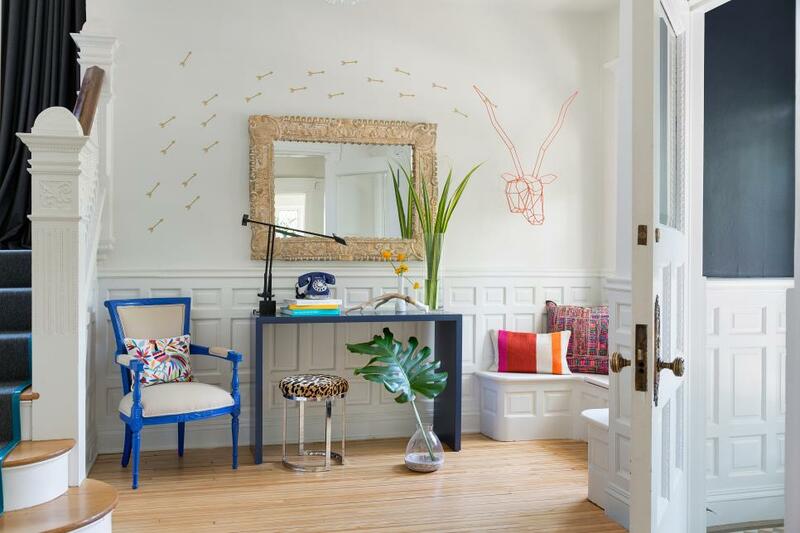 The eclectic mix of metallic finishes, animal prints and pops of neon color work together to create an entryway packed with personality and design inspo, for days. 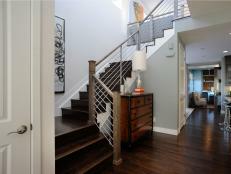 We’re huge fans of the way this foyer immediately establishes the casually elegant tone of the rest of the house. 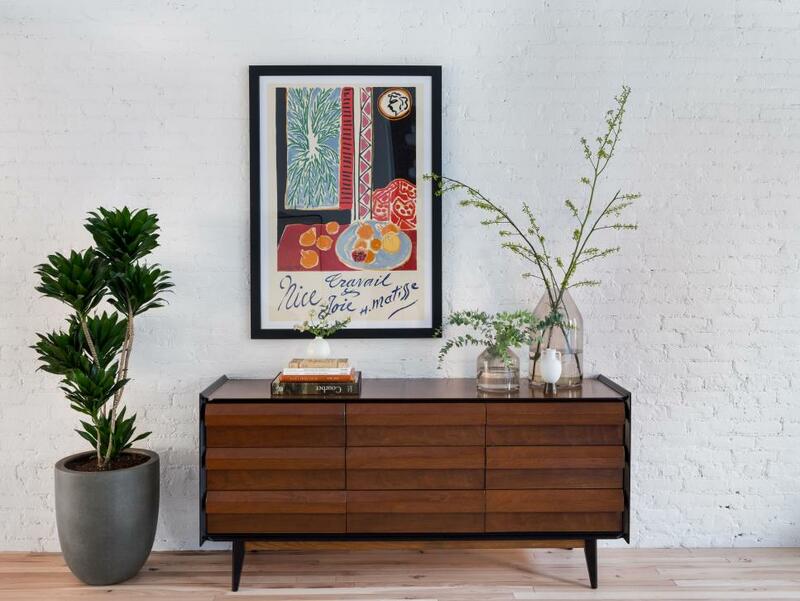 A midcentury credenza marries function with fashion, servings as stylish storage by the door for any unsightly, everyday necessities. 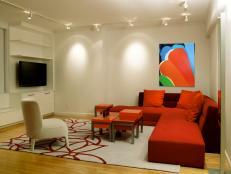 A rich, ruby red Persian rug adds a fancy touch that elevates the otherwise simple, laid-back design. 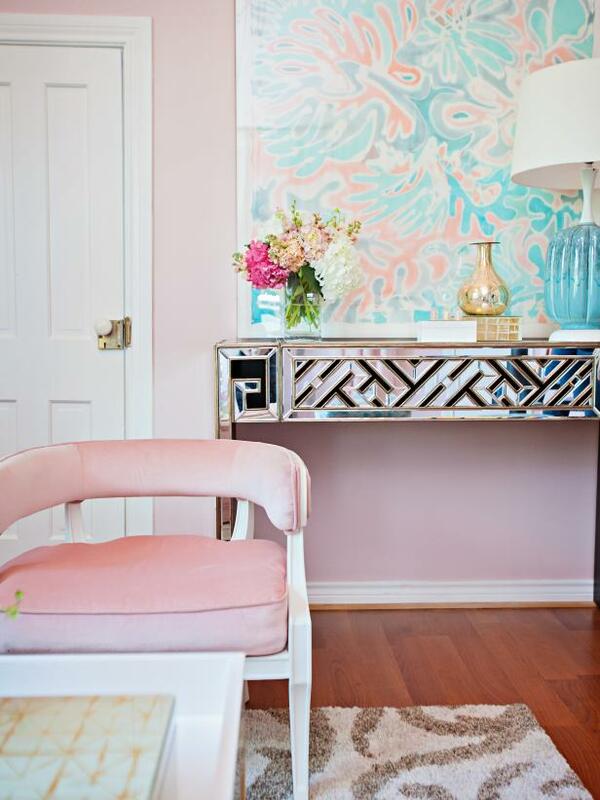 A feminine and flirty foyer? Yes, and yes. 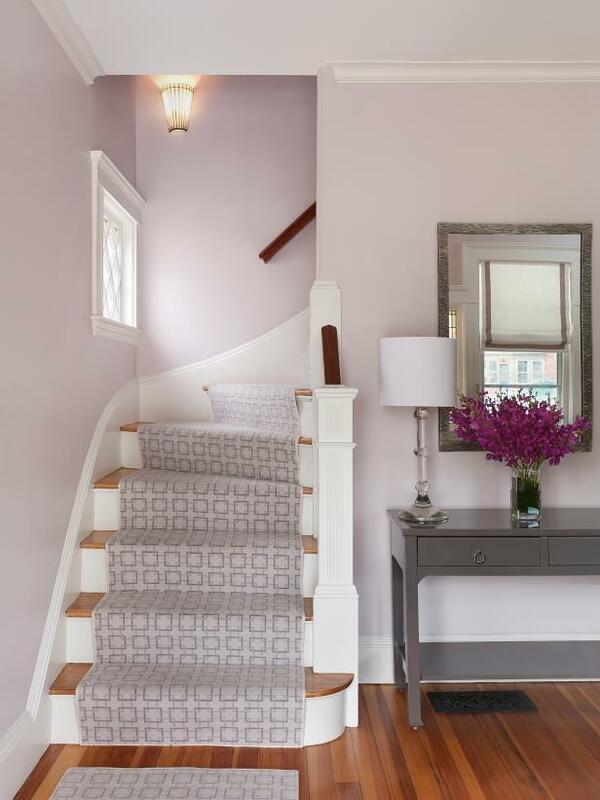 Pretty, pastel purple walls and a matching, winding stair runner greets guests with a refreshing interpretation of an elegant and traditional entryway. 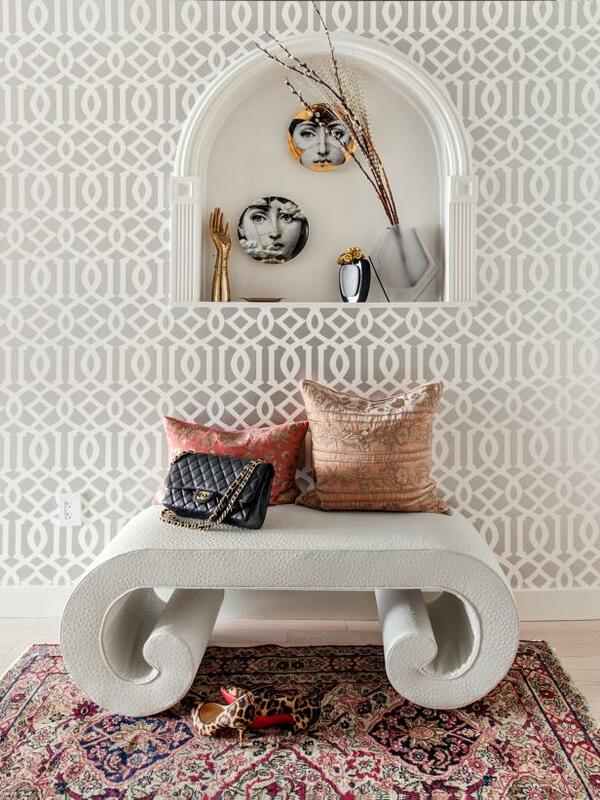 Rich, terra cotta toss pillows thaw the icy, silver trellis wallpaper in this eclectic entryway. An ornate rug adds coziness underfoot while the unique, curved bench speaks to the elegant arched nook overhead. 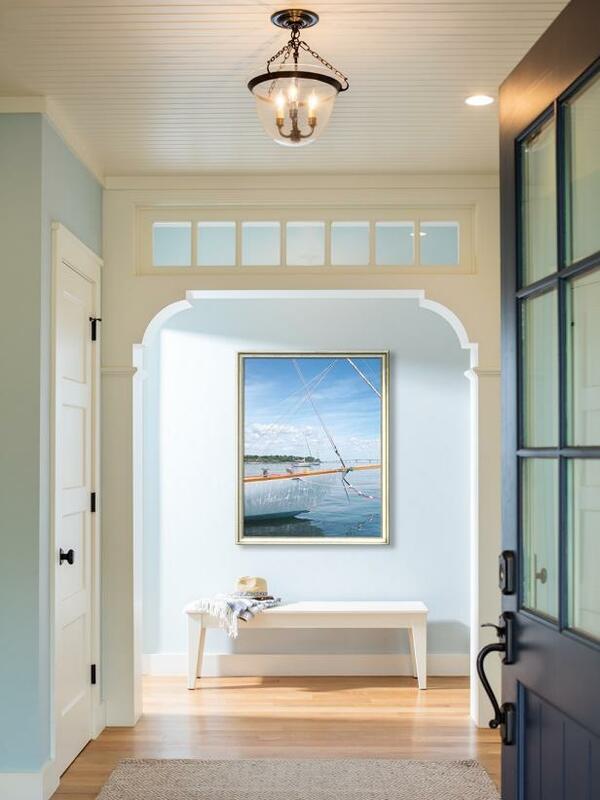 We’re dreaming of our next coastal getaway with this entryway’s playful mix of beachy hues. 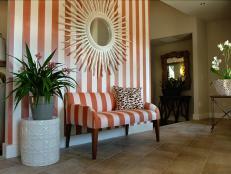 The sandy, beige grasscloth wallpaper adds a layer of texture and warmth to the space. A vivid aqua console contrasts the grasscloth, and joins forces with the nautical blue stair railing and watercolor wall art to infuse the entry with colors of the sea. 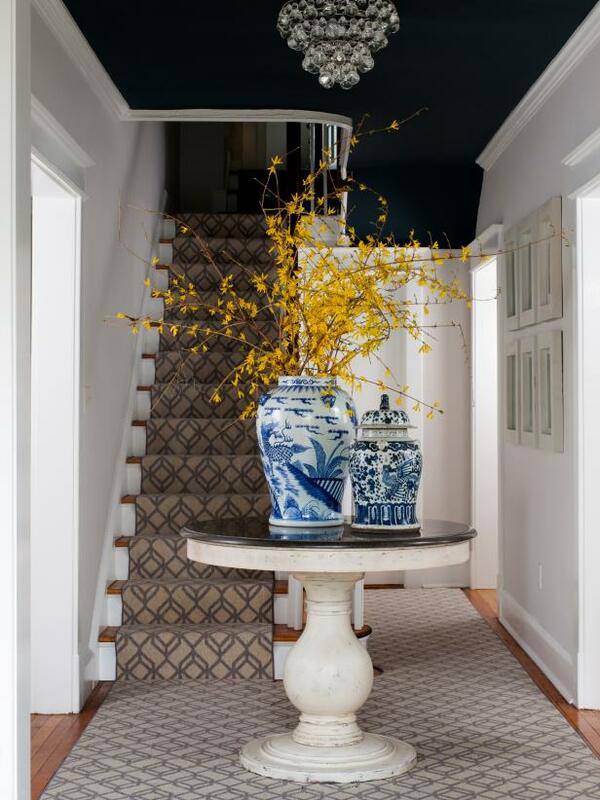 The classic and cozy, cocoa brown carpet in this traditional foyer is brought to life by blue and white pottery and overflowing yellow blooms. There’s a fairytale quality to the climbing floral vines featured in the mocha wallpaper that adds whimsy to this traditional foyer. A built-in bench features pretty plum and chartreuse pillows that complement the cozy mocha walls and round out the design. 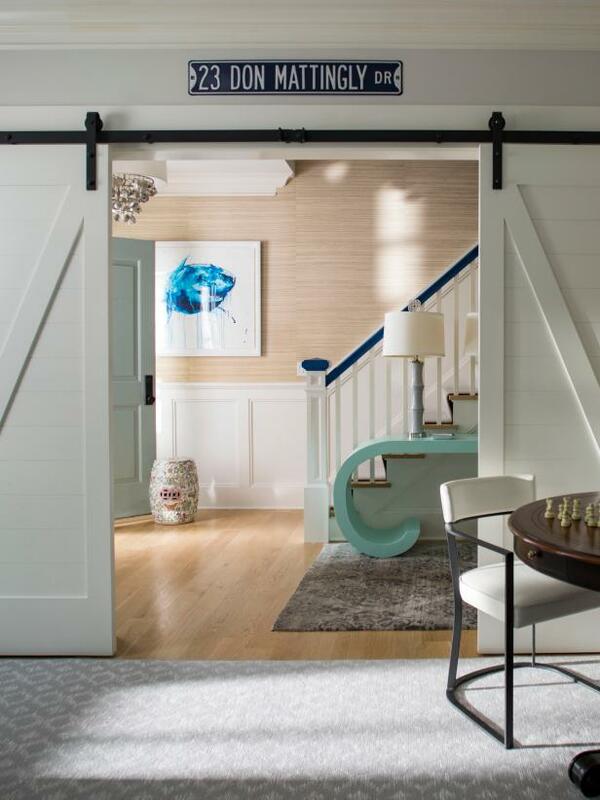 When guests come through this home's front door, they are greeted by a calming, light blue foyer that mirrors the peaceful surroundings of the home. 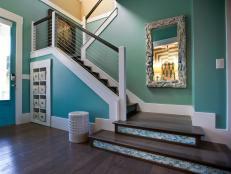 The misty blue walls and soft, white finishes grant the foyer an elegant, underwater quality. 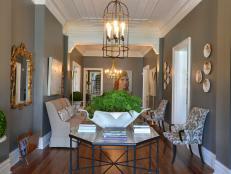 Stunning sage shiplap walls, custom mint benches and a vintage rug welcome guests in this traditional, farmhouse foyer. The earthy hues work seamlessly together in this space to create a design that is rich in detail, without appearing overdone or busy. 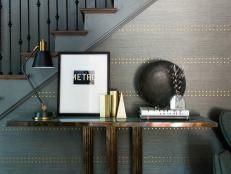 Metallic peacock-printed wallpaper creates a sophisticated backdrop to this eclectic entryway. 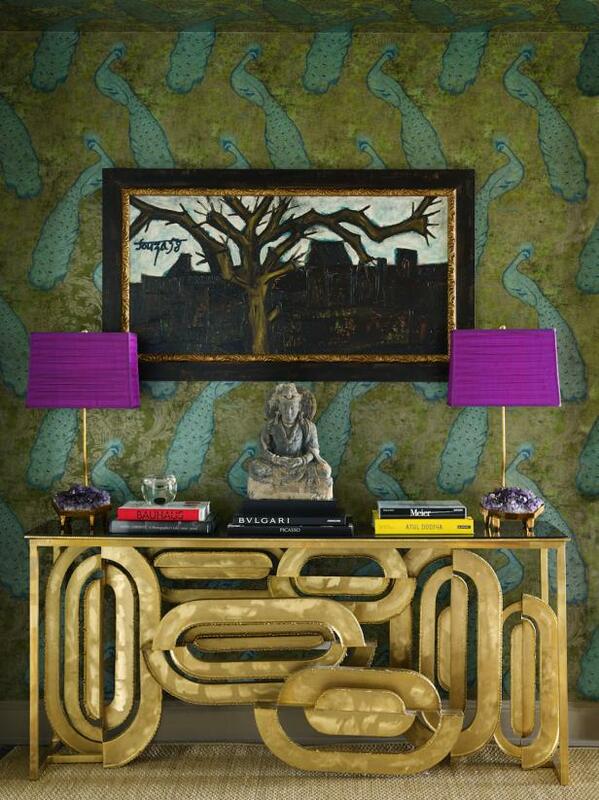 An abstract golden console table is visually stunning, while bright purple table lamps add a burst of color. 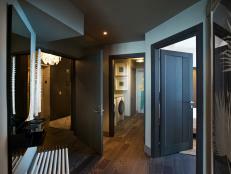 Symmetry serves this sultry entryway well. Bold, black and gold floor lamps flank the glam, golden buffet. 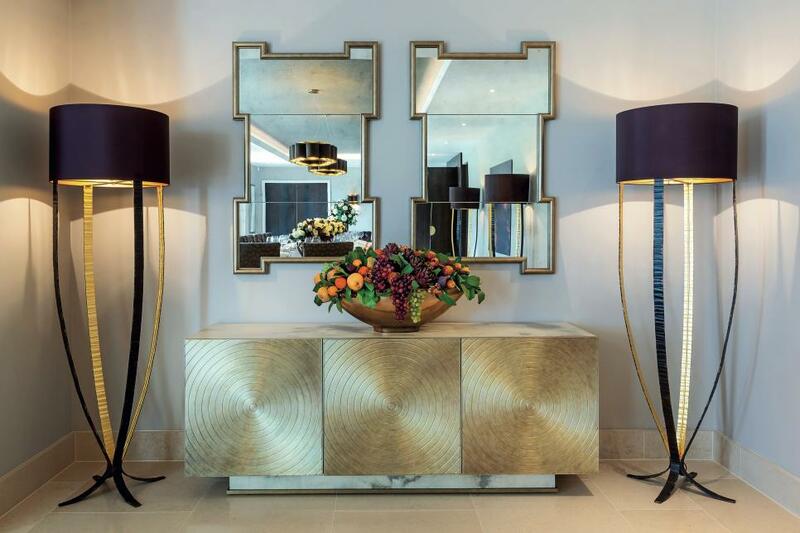 Above the table, twin geometric mirrors are mounted against the smoky walls to reflect the happenings of the glamorous home.